Lack of Sun Exposure & Type II Diabetes - Contemporary Evidence Suggests: There is a Link! "No sun, no diabesity protection." The evidence is equivocal and the number of studies low, but there is evidence that this statement could be true. Ok, it's November and not exactly sunny in the Northern hemisphere, but if you look back at the months June-August, how much sun exposure did you actually get, this year? Hardly any? 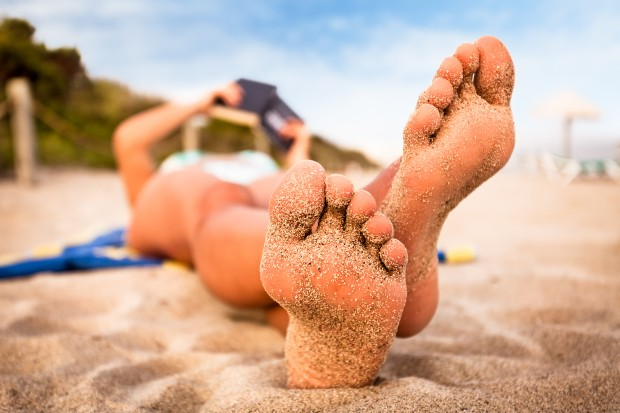 Well, that's bad news, because a recent review of the scant scientific evidence suggests that there is "a role of recreational sun exposure in reducing odds of T2DM incidence" (Shore-Lorenti. 2014). In view of the fact that the contemporarily available evidence is not exactly comprehensive, you should yet consider the following overview of the potential effects and mechanism as a "work in progress". As Shore-Lorenti et al. point out, the recent International Diabetes Federation (IDF) Diabetes Atlas (6th edition) describes a snapshot of the global diabetes burden in 2013 and projects this forward to the year 2035.1 Cur rently, an estimated 382 million global citizens have diabetes, costing around $1437 USD in 2013 for each person affected by the condition. Projections based on current trends predict that 592 million people will be living with diabetes by 2035; one in ten people will be affected, with an inordinate amount of fund ing required globally to treat diabetes and manage diabetic com plications ($627 billion USD in 2035). And while scientists are feverishly searching for a solution for the diabesity epidemic, the ongoing research into the effectiveness of vitamin D supplementation in diabetes have yielded inconsistent results (Mitri. 2011). Against that background it appears almost negligent that only few scientists have yet taken a closer look at the factors that trigger vitamin D sufficiency or rather the global low vitamin D epidemia. Lack of sun"low vitamin D" - that's not all! A lack of sufficient (unprotected) sun exposure - previous studies have shown that chronic sunscreen use decreases circulating concentrations of 25-hydroxyvitamin (Figure 1 | Matsuoka. 1988) - is one of the factors of which researchers speculate that it contributes to the development of vitamin D deficiency even in those of us who live in areas with a high annual sun-exposure. 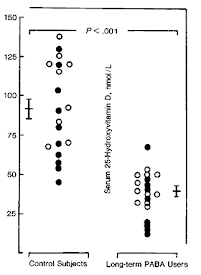 Now, if restoring the 25-OHD (vitamin D) levels to normal does not work the anti-diabetic magic it is supposed to do and our D-levels are low due to insufficient sun-exposure, it appears only logical to assume that a lack sun-exposure and not a lack of vitamin D is one of the factors that contributes to the ever-increasing rates of diabesity - in conjunction with the usual subjects, obviously: The consumption of a junk-food diet and a lack of exercise, which is without doubt the #1 reason people in the Western Obesity Belt develop obesity, diabetes and the other characteristics of the metabolic syndrome. Against that background it's all the more surprising that evidence for an association between sun exposure and fasting serum glucose level is scarce. The study, the researchers from the University of Melbourne have in mind was conducted by Suarez, L. & Barrett-Connor, E. in 1988, already. If you look at the data Suaraez & Barret-Connor generated, you can see - even without their statistical sophisticated analysis - that there is a significant correlation between possible sun exposure (Figure 1, left) and the fasting plasma glucose levels (Figure 1, right). But sunlight gives you skin cancer, right? If you are the typical white-skinned tourist who grills in the sun for 8h a day in his 2-week beach holiday (=intermittent high exposure), yes! A chronic exposure to a moderate doses of sunlight, on the other hand, has been associated with a significant 27% reduced risk of melanoma (Nelemans. 1995). "[...c]onsidering that the unadjusted analyses and three of four of the studies included in the best evidence synthesis (including the study adjusting for physical activity) are in agreement, it is possible that future research may confirm that sun exposure reduces fasting glucose" (Shore-Lorenti. 2014). Shore-Lorenti et al. also point out that the highest level of evidence (moderate) for an association between sun exposure and T2DM outcomes in adults originates from the study by Lindqvist et al. (2010). In their paper, the researchers from the Karolinska University Hospital report a reduction in odds of developing T2DM given increased recreational (rather than occupational) sun exposure. In subjects with a low BMI the beneficial effect of using the tanning bed and sunbathing is even more pronounced (-60% risk). In the obese, however, it is significantly reduced (-10%) compared to the average reductions you see in Figure 2. "[...] to the frequency of sun exposure (perhaps leading to tolerance), duration, intensity and site of exposure (sun protective clothing and behaviour differences between the two settings), or perhaps selection biases for such work (for example, fair-skinned people may avoid occupational sun exposure or a less healthy lifestyle may be associated with manual labour)." Incidentally, a similar disparity between recreational and occupational sun exposure is well described for risk of developing melanoma (Chang. 2009). Overall, we are thus left with the above overview (Table 1) as a conclusion of which the mere number of "unkown"s and "inconsistent"s tell you that we are not yet at the point to draw a water-proof conclusion. Bottom line: All in all, it appears to be likely that a lack of direct and regular moderate sun exposure is among the many lifestyle factors that increase your risk of developing type II diabetes. The ameliorative effects of obesity, researchers like Lindqvist et al. (compare Figure 2) have observed, on the other hand, should remind you that you won't get away with "just" getting enough sun exposure. Regular physical activity and a whole foods diet for obesity prevention are at least as important as the hours you spend in the sun | Comment on Facebook! Speaking of hours in the sun, the overall beneficial effects are more likely to be related to the beneficial effects of sun exposure on circadian rhythmicity than on its effect on other chemical processes, such as the formation of vitamin D.
Chang, Yu-mei, et al. "Sun exposure and melanoma risk at different latitudes: a pooled analysis of 5700 cases and 7216 controls." International journal of epidemiology (2009): dyp166. Chen, Shui-Hu, et al. "Community-based study on summer-winter difference in insulin resistance in Kin-Chen, Kinmen, Taiwan." Journal of the Chinese Medical Association 71.12 (2008): 619-627. Lindqvist, Pelle G., Håkan Olsson, and Mona Landin-Olsson. "Are active sun exposure habits related to lowering risk of type 2 diabetes mellitus in women, a prospective cohort study?." Diabetes research and clinical practice 90.1 (2010): 109-114. Mitri, J., M. D. Muraru, and A. G. Pittas. "Vitamin D and type 2 diabetes: a systematic review." 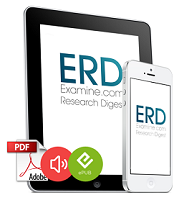 European Journal of Clinical Nutrition 65.9 (2011): 1005-1015. Nelemans, P. J., et al. "An addition to the controversy on sunlight exposure and melanoma risk: a meta-analytical approach." Journal of clinical epidemiology 48.11 (1995): 1331-1342. Shore‐Lorenti, Catherine, et al. "Shining the Light on Sunshine: a systematic review of the influence of sun exposure on type 2 diabetes mellitus‐related outcomes." Clinical endocrinology (2014). Suarez, L., and E. Barrett-Connor. "Seasonal variation in fasting plasma glucose levels in man." Diabetologia 22.4 (1982): 250-253.